Oooh and because it's March (already?!) we've got a new muse to admire! I have to confess that I am *super* excited by this muse - I adore her style and genius when it comes to her cards. She's honestly had my jaw hitting my keyboard on a number of occasions! Well enough gushing - I'll spit it out; our muse this month is Laura Bassen! Check out the original post of this card here! So c'mon, I know you're inspired by Laura's card...I suggest that you check out the rest of the amazing CASE Study DT's take on Laura's card and then get creative! Amy Wanford &lt;---you are here! Well that's me signing off for now...it's turning out that this week is actually just as busy as the last week! Roll on the weekend...! Oh my. Pure happiness when I look at all the CAS gorgeousness on this card. Absolutely beautiful Aimes! Well I just KNEW you would knock this one out of the park, Aimes, with your CAS prowess being what it is! 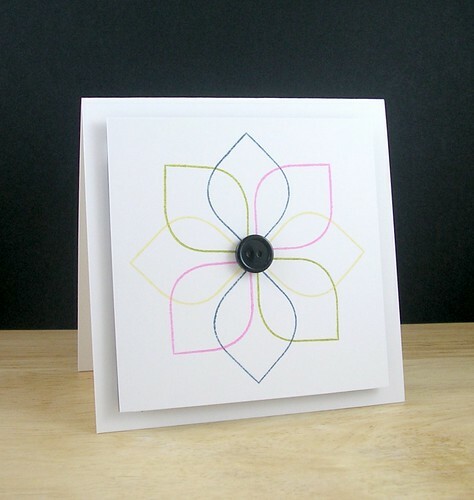 Love that simple yet beautiful flower and all that yummy white cardstock. Oh my! You always know how to work magic with modern basics! I love this ultra clean look without sentiment, so heavenly! Thanks so much for such sweet comments about my cards! You are too kind! love the bright happy color and how airy the card is. It is perfect without sentiment. So listen, this card is pretty darn fantastic and I can tell you about a million reasons why, but the one thy I just have to mention is how perfectly aligned it is. I would have to have done it like 10 times to get it just right, and the button? Fogetta-bout-it!!! You done good! Absolutely wonderful Aimes! You have picked the perfect colours that go together to make that beautiful flower! Oh Aimes! This is INCREDIBLE!!! You always amaze me when you whip out modern basics! AWESOME! Love this! So clean and crisp! Fabulous!